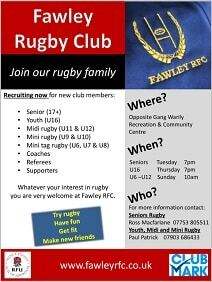 Fawley RFC is founded in the southern Waterside area in the 1920s drawing players from the villages of Fawley, Blackfield, Holbury and Hythe. In 1935 the Fawley & District Rugby Club became associated with the AGWI Recreation Club and the Club name was changed to AGWI RFC. Membership was open to AGWI employees and associate members from the locality, with a lot of players coming up from the Military establishments at Marchwood, RAF Calshot and HMS Diligence. The Club was re-founded after the Second World War.